Napoleon III, Louis-Napoléon Bonaparte (20 April 1808 – 9 January 1873) was the only President (1848–52) of the French Second Republic and, as Napoleon III, the Emperor (1852–70) of the Second French Empire. He was the nephew and heir of Napoleon I. He was the first President of France to be elected by a direct popular vote. 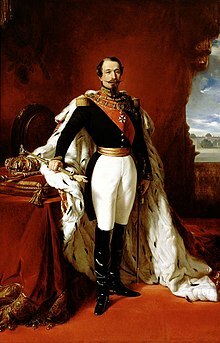 He was blocked by the Constitution and Parliament from running for a second term, so he organized a coup d'état in 1851 and then took the throne as Napoleon III on 2 December 1852, the forty-eighth anniversary of Napoleon I's coronation. He remains the longest-serving French head of state since the French Revolution. Napoléon III, Des Idées napoléoniennes, edited by Henri Colburn, London (1839), chapter 3, p. 39: En politique il faut guérir les maux, jamais les venger. Sometimes reported as his last words, as quoted in Dictionary of Phrase and Fable (1898) by E. Cobham Brewer, these were among his final comments to Dr. Henri Conneau. Variant translation: It is usually the man who attacks. As for me, I defend myself, and I often capitulate. I never admired the character of the first Napoleon; but I recognize his great genius. His work, too, has left its impress for good on the face of Europe. The third Napoleon could have no claim to having done a good or just act. 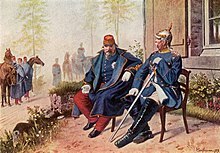 At the same time Paris learned that fifteen of the inviolable representatives of the people had been arrested in their homes, during the night, by order of Louis-Napoleon Bonaparte. This page was last edited on 22 August 2018, at 00:12.